The classic Joy of Cooking says in praise of mangoes, “When chilled and eaten raw, they are as good as any peach-pineapple-apricot mousse you can concoct — rich and sweet but never cloying.” (Though it adds, “If unchilled, they sometimes have the faintest savor of turpentine.”) This fruit needs very little to make it into a complete dessert, which is good for all of us, but especially for me, with my four-ingredient limit and my pile of mangoes in the fridge. Of course, I could have just puréed the mangoes, added a little sweetening, and dissolved some gelatin to thicken the mixture. 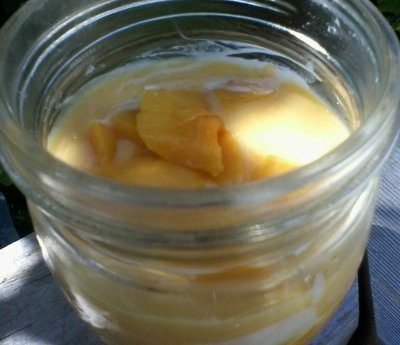 Instant homemade “peach-pineapple-apricot mousse”, anyone? But this week’s dessert was supposed to be specially designed for a barbecue. To me, that cried out for individual servings in mason jars, and they cried out for layering. Yes, any dessert looks nice in a glass jar, but layered desserts look nicest of all. So how many different layers could I make with four ingredients? I stopped at three layers, after deciding not to go with a layer of plain yogurt. But if you want to add more fruit, maybe a layer of pound cake at the bottom, nuts or sprinkles on top, they’ll all work. Skip the orange extract if you want, or substitute vanilla extract. Experiment with different flavors of yogurt, also. To tell if a mango is ripe, squeeze it gently and see if it gives slightly, says the State of California, where they know their tropical fruit. It should also smell sweet. Avoid mangoes with bruised or broken skins. If you end up with any unripe ones, keep them at room temperature to ripen — then in the fridge to keep them fresh (and get rid of the turpentine taste). Peel the mangoes and cut the flesh away from the seeds (scrape the knife along the seeds to get as much off as you can). Chop two mangoes’ worth of flesh into dice. Set aside half the diced mango and mix the other half with half a cup of the yogurt. Purée the other two mangoes’ flesh in a food processor or blender. When they’re smooth, add the other half cup of yogurt, the sugar, and the orange extract. Layer the two mixtures in a small mason jar (or plastic cup) and finish with the reserved diced mango on top.